Carol Korpi, a nurse from Seattle, traveled to Tong Neak in 2007 with Dorothy Lennstrom, a school teacher. Carol had planned to do an initial survey of the medical needs of the village. There was a misunderstanding and 150 women showed up to receive medical care from what they thought were two American doctors. Returning to the U.S., Carol shared this experience with Ray Durr, the founder of CUSP. Out of that conversation came the vision to build a guest house to house medical professionals who would serve the poor in this rural area. 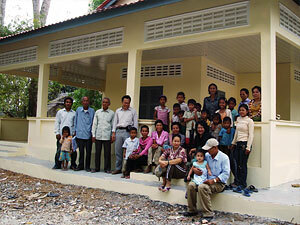 Two years later, the funds were raised and the guest house was built over a bomb crater. In 1971 the Viet Cong were travelling through Tong Neak and American planes dropped bombs on the village. The craters all remain except the one on which the guest house is built! In 1971 American bombs fell on the little village of Tong Neak near the Cambodian border. Their target was the Viet Cong but the village was hit. Uon Seila was a 14 year old boy who became a refugee, then captured and placed into forced labor with the Khmer Rouge only to flee again and make his way to Thailand. There he spent 14 years in a refugee camp. Now he has returned to his village and with his and the village elders oversight CUSP has built a guest house for American doctors and dentists to do short term medical missions to the village. The goal is that the guest house will also be used for English language lessons for the youth of the village. CUSP is soliciting interested doctors and dentists to partner with Medical Teams International and CUSP to travel to Tong Neak in 2011. Make friends you will never forget.